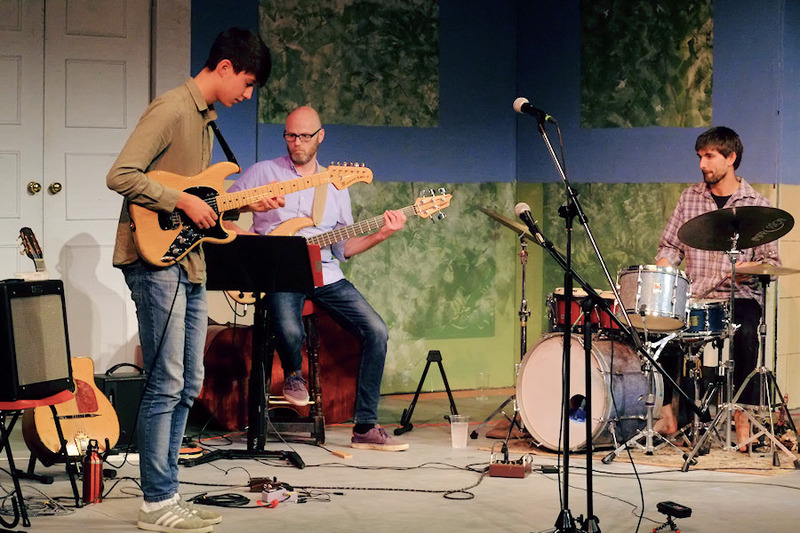 Sunday saw Newport Jazz Club again open it�s doors to young island talent with sets from the JukeBox Jazz Big Band and young guitarist Sol Grimshaw in a concert sponsored by Newport Parish Council. 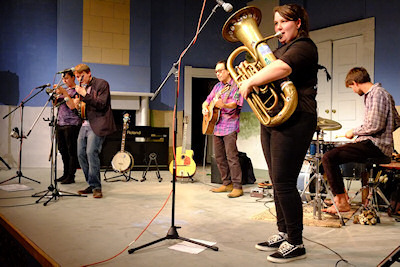 Early Dixieland jazz originating in New Orleans was a lively form of entertainment copied by the "Trad" bands of the 1950�s and JukeBox Jazz are carrying on the tradition. They opened their set with a lively rendition of "Sunny Side of the Street" which soon had the audience tapping their collective feet and greeting each number with a rousing round of applause. Fronted by Mark Thomas (vocals and banjo), Faye Williams (cornet) and Daisy Woodley (tuba and trombone) the band was augmented by Chris Jones (drums) and JC Grimshaw (guitar). Their lively set included versions of "Midnight in Moscow" and "The Sheik of Araby" and it is clear why JukeBox Jazz are such a popular draw on the island. The surname Grimshaw is well known to island music followers and now there is a new star burning brightly. At merely 17 years old it only seems a couple of years ago that Sol Grimshaw was strumming his ukulele with his father as a part of "JC and Family" during Cowes Week. Well that young ukulele player has blossomed into one of the most talented guitar players on the island. Sol was backed by Jez Gray (bass) and Chris Jones (drums). With Jez switching between upright and electric bass Sol gave a superlative performance switching effortlessly between powerful hard driving numbers to the sublime before switching to an acoustic guitar to duet with JC, making a guest appearance, on a couple of gypsy jazz numbers including a beautifully delicate version of "If I Had You". Both sets received a well deserved ovation and I have no doubt that we will be hearing much more from both artistes as the future of jazz on the island has a secure footing.